The OneUps are a musical collective hailing from Fayetteville, Arkansas, widely praised for their intricate, and eclectic approach to the art of game music. Stylistically diverse, yet meticulously skilled, the group has evolved over the past decade into one of the most dominant acts in the video game music scene. With well over 10,000 CDs sold and having performed nationwide -- including a very memorable performance at Penny Arcade Expo in 2008 -- The OneUps have garnered critical acclaim from popular gaming publications such as GameInformer and EGM. 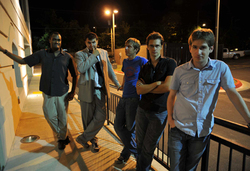 The band has also been featured, and interviewed by numerous online publications such as Destructoid, and MSNBC. While the band has changed its line-up over the years since its inception in 2000, each iteration has allowed them to explore a variety of genre from Funk to Jazz Fusion, and more recently, vocal Hip-Hop. Their latest effort, the Super Mario Kart Album, is currently available for purchase through Bandcamp, AmazonMP3, and iTunes.